Do you ever have books on your TBR list that you know next to nothing about? 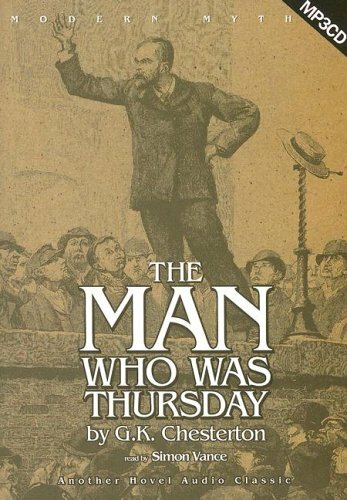 I’ve had The Man Who Was Thursday on my list for years, for the sole reason that it’s G.K. Chesterton’s most famous novel, and I’ve wanted to read more Chesterton (aside from Orthodoxy and some of the Father Brown stories, which I’ve already read). I had the vague notion that it involved spies, but that’s all I knew. At first, it did seem like a typical spy novel. In the opening chapters, a London man named Gabriel Syme finds himself going undercover in an organization of anarchists. Each of the men on the governing council of the anarchist group (yes, the anarchists believe in some sort of order) has taken on the name of a day of the week, and Syme manages to worm his way onto the governing council as their new Thursday. Overseeing the group is the mysterious Sunday, a man whose very presence instills in Syme a sense of dread and fear. For quite a while the story moves along much in the way that I expected. There are double-crosses, dynamite plots, and secret identities revealed. Eventually, though, the story gets more a more surreal, and I realized that the subtitle “A Nightmare” is as significant as the main title. To say that the novel develops a nightmarish quality is not to say that it’s scary. I think perhaps most nightmares are only scary to the person who dreams them. And Syme seems to be living a nightmare in which nothing is what it seems. Locations and identities shift in unexpected ways, just as they do in dreams. Chesterton was a Christian, and the nightmare he concocted is infused with Biblical imagery. This is not, however, a straightforward Christian allegory—or if it is, it’s too subtle for me. I could just about wrap my brain about some of the ideas Chesterton was getting at, but the story would always move on before I could quite get there. This is a disadvantage of audio. I listened to several sections multiple times, but I would have liked to just ponder specific paragraphs, which is not a viable option with audiobooks, especially in an audiobook with long tracks, like this one. Most tracks were around 10 minutes, and there were several times when I wanted to backtrack when I was 8 minutes in, just to listen to a paragraph or two again. If I’d had the book in print, I could have pondered individual moments as much as I wanted. On balance, though, I did enjoy the book. I enjoyed how twisty it was and how it took me places that I didn’t expect (although one particular series of twists became obvious to me before it did to Syme). There are some wonderfully surreal bits toward the end that I just enjoyed as word pictures, even if I didn’t understand what Chesterton was doing. The audio production, read by Simon Vance, was well done, with the exception of the overlong tracks. I do think I would have liked this more in print, which would have allowed me to think through the images and ideas a bit more. I pretty sure that there are some interesting ideas buried in there, but I’ll need another turn with it—in print—before I find those ideas. This entry was posted in Audiobooks, Classics, Fiction, Mysteries/Crime, Speculative Fiction. Bookmark the permalink. I love Chesterton, even when I don’t necessarily know exactly what he’s on about. He comes out with this one-liners that crack me up – when someone tells Syme (I think) they are going to abolish right and wrong and he says he hopes they will abolish right and left too (“They are much more troublesome to me”). Dude, story of my life. Chesterton is great with the wit, it’s true! I do that too. I try to do it really discreetly so people won’t notice that I don’t know left from right. That’s my main beef with audiobooks–I don’t have a chance to sit, savor, and reread passages. I’m glad you enjoyed this! Sometimes audiobooks actually force me to slow down more than I would when reading in print, especially if the story is exciting and I want to see what happens right now! It’s books like this that require more doubling back and flipping around that don’t work for me. I would really like to read this (rather than listen to it, following your account!) but it’s been out of print in the UK for a while. I should check again – time has elapsed and it may well be available. I have all his Father Brown short stories, but this novel is supposed to be his best work. I hope you’re able to find it! I wouldn’t think such a well-known book would stay out of print for long. Project Gutenberg does have it, if you can bear to read online or print out the full thing. Your review sounds a lot like my impression of Kazuo Ishiguro’s The Unconsoled. Have you read it? I feel the same way about certain audiobooks. I’ve actually decided to only listen to those books I know I’ll be able to follow easily. I haven’t read The Unconsoled, but more Ishiguro is on my list. I try to limit my audio reading to books I think I can follow, but sometimes I’m surprised by what works and what doesn’t. I really loved this book (I read it more than 10 years ago now); I’ve been wanting to read it again. With all the symbolism and all, I imagine this would stand up to rereading. Great review, Teresa! This is a book that I’ve had on my mental TBR list for a while even though I knew nothing about it. Your review has remedied that, and I must say I’m very intrigued and excited to pick it up… In print, of course! Wonderful. I hope you enjoy it. I’ll be very interested to hear what you think. I read this a long time ago and it is one that’s due for a re-read. I think your comments on audio books are interesting. With the prevalence of listening devices it is surprising that novels are written with the audio version in mind first now. Print version to follow as a after thought! Rob was just asking me about this book on Twitter :-) I do think I would have liked it more in print. I’ll give it another try one day. I haven’t heard of books being written with audio in mind first, but I have heard of them being written with the movie screenplay in mind. The results are often not so good. I’d be curious to see if the same happened to a book written with audio in mind. I am interested in reading this, even if it is a strange read! I’ll keep an open mind when I do read it. I enjoyed Chesterton’s short stories. Have you read those? I’ve read several of the Father Brown stories, but it’s been close to 20 years, so I remember nothing except that I liked them. Wow! Two out of the most recent three reviews are of books I’ve reently read!!! Great minds think alike…..
Just read this – it certainly confused me quite a bit, but in an intriguing rather than annoying way!